The aesthetically and thematically provocative Part 8 fitted the Twin Peaks mythos into our very real history of atomic destruction. And this week's Part 9—a return to the uncanny banal in which cowriter-director David Lynch specializes—reverses that by bringing an important element of Peaks' make-believe universe squarely into our own. At the center of “The Return, Part 9” is Maj. Briggs’ message to his son. And it is a message to his son, though Garland told Betty Briggs (Charlotte Stewart) to deliver the little metal cartridge to Bobby, Hawk, and Sheriff Truman (“I didn’t know it would be this Sheriff Truman”) when the time came. The Major coded his map so only Bobby will know its reference points, but that’s not all. 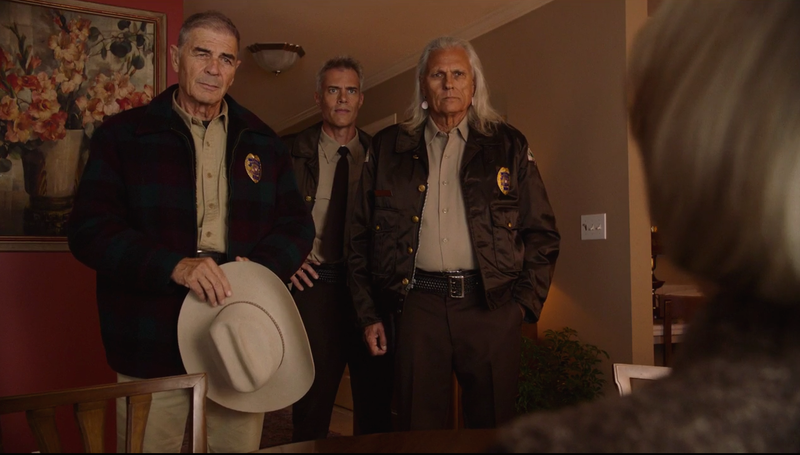 He concealed the message in a mechanism that his son—and, among the Twin Peaks Sheriff’s Department, only his son—knows how to open. The way to open this mysterious cylinder isn’t to fiddle with it. There are no latches or locks that will yield to poking and prodding. You have to listen to this mystery, and you have to find a way to make it vibrate at the right frequency. Seeing Bobby Briggs fling the cylinder to the pavement, then chase after it to scoop it up, it’s obvious that opening the puzzle is no chore. It’s a joy. There’s a beautiful metaphor here, and one that’s consistent with Dale Cooper’s philosophy, and usually with David Lynch’s narrative approach. It’s the illogical logic of yielding to intuition rather than straightforward investigation. If director David Lynch and co-writer/co-creator Mark Frost have proven anything in this inventive, powerful relaunch of their supernatural soap opera, it’s that they can do pretty much anything they damn well please. A show that spends minutes on end inside a nuclear explosion one week can depict lovable goofballs Deputy Andy and Lucy Brennan ordering living-room furniture the next. But take a close a look at the Sheriff’s Department’s power couple, and you’ll see that their debate over what color chair to get (she wants beige, he wants red) reveals hidden strengths of the show and its fundamentally warm heart. After a deadpan back and forth in which the couple stomp from one computer to another, the deputy finally relents, apologizing and hugging his wife before telling her she can go ahead and go with the beige. When he returns to his desk, however, she grins and picks the red instead – a surprise he’ll no doubt cherish. On the show, the tiniest details are often a gateway to something bigger. The hole that the mentally disabled Johnny Horne leaves in the wall he crashes into head first; the bright red rash that Ella, a junkie played by musician Sky Ferreira, scratches obsessively; the dimly audible hum Ben Horne and his romantically interested assistant Beverly Paige continue to hear in his hotel; the squeak voice Ben’s brother Jerry believes is coming from his own foot; the electrical socket Coop, a.k.a. Dougie Jones, stares at in the Las Vegas police station where he’s been brought for questioning – all of them feel like gaps that could widen at any moment and swallow us. Whether haunting or heartwarming, this is a series can do a lot with a little.